"Everything disappears and everything remains in the universe." 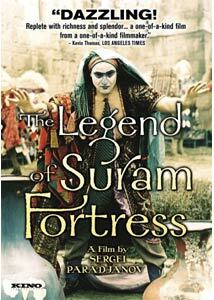 The Legend of Suram Fortress (presented on the title screen and in the subtitles as Surami) was Sergei Paradjanov's first feature film made after his lengthy stay in a Soviet prison camp during the 1970s. Much weakened by the brutal experience, Paradjanov nevrtheless demonstrated his skill for making films filled with startling imagery and sound. Suram Fortress comes to us in a freshly restored version courtesy of the Russian Cinema Council and Kino. One feels compelled to warn viewers ahead of recommending a film like this, so alien is it to typical movie-going experiences, but it really needs to be seen to be appreciated for the cinematic marvel that it is. The heart of the film's narrative is centered around the building of forts to protect the people of Georgia (Paradjanov's country of origin). The most important is the Suram Fortress, but it repeatedly crumbles each time it is built. Finally, a fortune teller tells the way to save the fortress: a young man must be walled up within the fortress, giving his life to the very building itself. Like Paradjanov's other work, Suram Fortress centers around the life of the people, their music, their culture, and their religion. The film can be frsutrating to watch, as it often veers away from whatever strand of plot it was following into something completely different. The message that can be read into the film, namely that of sacrifice of the self to preserve one's homeland, would be a pungent one for Paradjanov, who sacrificed years to the Soviet system that dominated his own country, among others. But to frame the film as a simple urge to patriotism sells it short, as there's plenty else to occupy the mind here. If the film has a weakness to me, it's that it often feels overly stagy, as numerous shots are filmed as if the action is being played out for us, rather than a more organic approach. But the expected use of sound and music are excellent, and the film is still quite remarkable to look at. As with Paradjanov's other works, this certainly isn't going to appeal to a large chunk of the filmgoing audience, but those who can tune into its wavelength will find much to admire. Image Transfer Review: Taken from Ruscico's previous PAL transfer, this looks quite fine, based on what was available. Colors are decent, though some areas show a general instability. Paradjanov's films are likely never going to appear in pristine, optimal prints, so this is acceptable. Audio Transfer Review: In an improvement over previous editions, Kino has restored the original Georgian mono track to the film, albeit with about four minutes of material that had to be sourced from the Russian voice over soundtrack. The Georgian is much preferable to the otherwise useless Russian track, which simple features a lone Russian reading out a translation on top of the Georgian track. Extras Review: Three main items of interest; first is an interview with Paradjanov's wife, Svetlana Scherbatyuk (00h:26m:37s), which provides some insight into the director's life. Actress Veriko Andzhaparidze is next, with a brief interview covering her work in the film (00h:09m:21s), and finally there is The Architecture of Ancient Georgia, a brief (00h:06m:20s) that looks at the titular topic without getting into too much detail. Trailers and a photo gallery wrap things up. Paradjanov's films demand to be seen, and they cannot be suitably described in words, so your best bet is to simply see it for yourself and judge accordingly. Not for all tastes, but remarkable all the same. The DVD is perfectly fine.